Friday we went to see Harry Potter in the afternoon with our 7 year old. I loved it. So did my son. Wes had some reservations about what they omitted from the book. [This has been discussed ad infinitum in other blogs so I'll just leave it at that.] Our younger son was over at a friend's house. We picked him up and the boys immediately started to argue about where to get dinner. Somehow they agreed on a local hamburger place. I begged off and got dropped off at home. 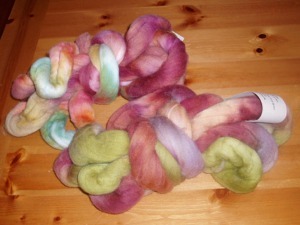 I walked through the front door and suddenly remembered there was drop-in spinning at Weaving Works. I grabbed up my stuff and ran over there. I had to take Wes's Toyota. Let me tell you it's much easier getting an Ashford Traditional into the back of a Passat station wagon than the back seat of a Camry. I brought the second Butternut Woolens combed top with me. I loved the way the first one came out. But this second one just did not have it going on. The colors were different. The wool was different. I couldn't draft it to save my life. 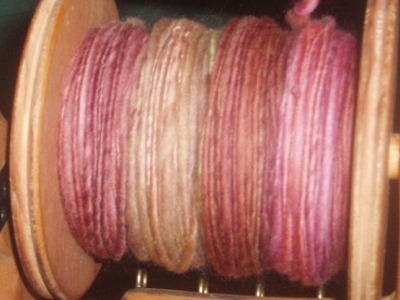 On the first one I didn't split the roving and gave the yarn long, distinct areas of color. I could not make it happen on the second one. 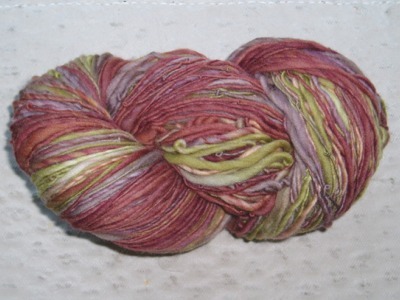 I ended up just surrendering to it and split the roving, broke off the wool in color sections, flick carded it and then spun it. It was a drag. And I think it's coming out much thinner than last time. I came home and fell asleep on the sofa. Wes woke me up so I went into my bedroom. And fell asleep on the bed fully dressed. Saturday was playdate insanity. The boys and I went to my best friend's house to play. She has two girls. Her oldest and my oldest were absolute best friends until kindergarten started. They don't play when they're at school now but when we get them alone they have a great time. So the kids played and I got to sit and talk with my friend and knit. It's been a long time since we spent a morning like that. Then we raced home so we could babysit a little boy in my younger son's class. I put Wes on kid patrol and went into my office to knit and little to podcasts. On Cinecast they reviewed the original Texas Chainsaw Massacre. I came out of my office when I heard my son running down the stairs. He was yelling and pretending to be scared. His little friend was running behind him revving a toy power saw. I couldn't make this stuff up. After playdate two we dropped the kids off at yet another friend's house so Wes and I could meet some old friends for dinner. They've moved from Seattle to the eastside and we never see them any more. We decided to go to Dandelion (the flash-heavy site makes the place look a lot more pretentious than it is). I had a great meal there before. When we sat at our table we immediately noticed that it was freezing. I went to the bathroom, heated to about 85Â°, and saw that the back door was propped open. Well no wonder it's cold. I asked the waitress to close it and she told me that they couldn't or the front door would pull open. I stared at her in incredulity. I asked if there was something else she could do so we wouldn't, you know, freeze our asses off. She offered to turn the heat up. So hot air blew on our heads as artic winds blew past our legs. Wes got on the phone and had the Market Street Grill hold a table for us. We left and had a great, appropriately heated dinner. 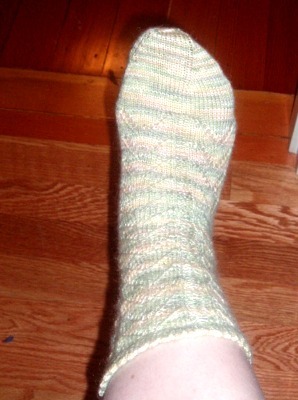 And I just finished the first Latvian sock.